Get the Disney Masquerade Ball dress up game started! Try exquisite elegant evening gowns on the pretty Olivia doll model. 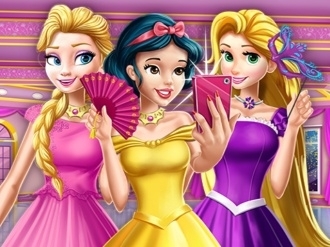 Match each dress with the right hairstyle, shoes, glam clutch, earrings, necklace and princess tiara. Frozen Anna will look smashing hot in the contemporary green and black printed dress. That white one shoulder sheer gown is perfect for Frozen Elsa. Those two sparkly mermaid style dresses are absolutely divine. Which one better suits mermaid Ariel? Check out the strapless princess dress designs as well! 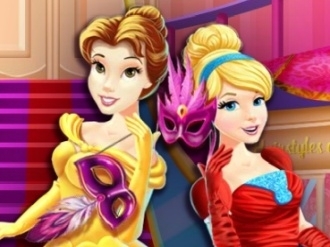 Dress up as Disney Aurora wearing the astonishing yellow one or as Snow White wearing the pastel blue gown for example. Or is it the ruffled dark blue dress more appropriate for a masquerade ball Snow White look? What haircut and studs go with the lovely pink Olivia dress? Don't forget the most important accessory, the masquerade ball mask! 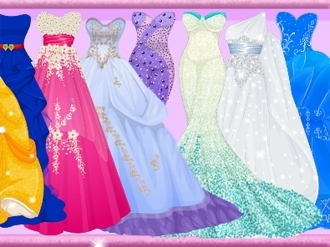 Have a fantastic time playing our brand new Disney Masquerade Ball dress up game!